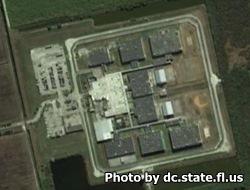 South Bay Correctional Facility is located in Palm Beach county Florida. It is a level V facility that houses medium, minimum and closed custody inmates. The current capacity for this institution is 1,948 male adult offenders. Inmates incarcerated here can get an adult basic education, earn their GED, and receive substance abuse treatment. Vocational programs offered at this facility include masonry, upholstery, furniture refinishing, plumbing, engine repair, carpentry, commercial class B driving, and environmental services. In order to visit an inmate you must first fill out a visiting application and wait for it to be approved. Once approved you may visit your inmate on Saturdays and Sundays from 9am-3pm. Registration for visiting begins at 8:15am and is over at 2pm. If you arrive after 2pm you will not be allowed to visit your inmate.